For most of us, the holidays usually mean some time away from work, a chance to hang out with friends and family, and an excuse to kick up our feet and relax a little. That is, unless, you happen to be in the cyber-attack business, where the holidays could be the perfect time for you to strike unsuspecting e-commerce sites and deal-happy consumers. For most of us, the holidays usually mean some time away from work, a chance to hang out with friends and family, and an excuse to kick up our feet and relax a little. That is, unless, you happen to be in the cyber attack business, where the holidays could be the perfect time for you to strike unsuspecting e-commerce sites and deal-happy consumers. 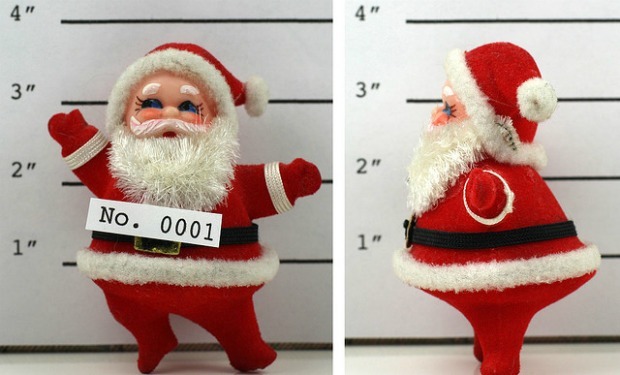 Do cyber attacks take the holidays off? The folks at CloudFlare, providers of commercial, cloud-based services to help secure and accelerate websites, looked at data across more than 100,000 websites. According to their data analysis, on a typical day, 15.31% of requests to a website are some sort of cyber threat. While that pattern is relatively stable, the day-to-day average can swing by as much as 10%. 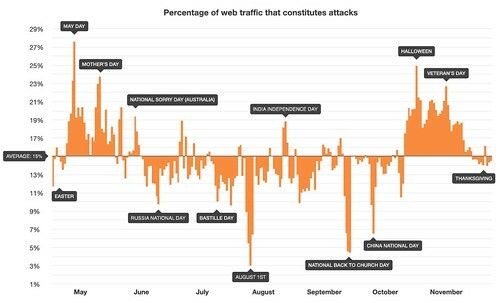 In looking back at this year’s holidays, cyber attacks seem to be the heaviest around May Day, Mother’s Day, Halloween, and Veteran’s Day. If those numbers hold true, that means you’ll want to do your online shopping for flowers, gifts, and costumes a little bit early. Attacks affect different types of sites at different times. For example, while overall attack traffic was relatively stable on Cyber Monday, CloudFlare found that e-commerce sites saw a 45% increase in attack traffic directed at them on the busiest online shopping day of the year. CloudFlare’s data helps to serve as an important reminder: Just because you’re wearing stretchy pants and taking a nap after a big holiday meal doesn’t mean hackers are doing the same. They could be hard at work, looking for opportunities to take advantage of all of the noise caused by the hustle and bustle of the holidays to prey on unsuspecting shoppers.